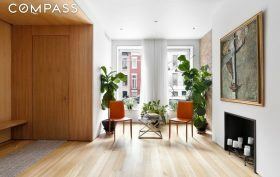 Sleek casement windows and a minimalist grey facade are the first sign that this otherwise unassuming mid-block home at 419 East 84th Street isn’t your average $9.99 million Upper East Side townhouse. Inside, the Euro-chic flush surfaces, exposed brick, and wide open spaces of a downtown loft condo span five stories, from the garden floor au pair suite to the floating glass staircase to a wood-beamed skylit top floor. At 6,000 square feet, though, it’s the size of three lofts, with the added perk of being situated in classic Yorkville, just a block from Carl Schurz Park and two blocks from the new Second Avenue Subway.